Millions of people shovel their driveways with no ill effects. In fact, shoveling snow can provide an excellent workout (more on this below). But if you have a personal history of cardiovascular disease, shoveling snow can trigger a heart attack. That's right. As if recent winter storms haven't caused enough problems, now you have something else to worry about. Shoveling snow can kill you. But, unlike the frigid temperatures, icy roads and cancelled airline flights, this one is under your control. We know that heart attacks and deaths from heart disease tend to peak in the winter months. There are many potential explanations for this observation. Colder temperatures increase the tendency of blood to clot and cause increased blood pressure, both of which can contribute to heart problems. Couple these effects with the exertion and blood pressure bump associated with shoveling snow and you create a recipe for disaster in the susceptible individual. People with these conditions often have vulnerable plaques in the arteries of the heart. These vulnerable plaques cause partial blockage of the arteries. When subjected to stress (e.g., higher blood pressure during shoveling), the plaques may rupture, leading to formation of a blood clot that completely blocks the artery. That complete blockage causes a heart attack. 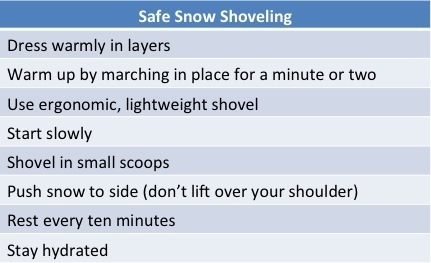 If you have one of the conditions on this list, lay down your shovel. Get somebody else to clear your driveway. Hire a neighborhood teenager. Or, better yet, try to convince your own son or grandson to put down his iPad for a few minutes and take up a shovel. It's not just heart doctors that worry about shoveling snow. Orthopedic doctors also recognize risks. Shoveling can be back-breaking work. Literally. If you have a history of back or neck trouble, skip the shoveling. On a personal note, I have not touched a shovel since I had back surgery. A few tips can reduce your risk of orthopedic trauma at the hands of winter snow. If you feel pain in the chest, neck or left arm or shortness of breath, stop immediately and go inside. If the symptoms do not resolve in five minutes, call 911. According to the Surgeon General's Report on Physical Activity and Health, 15 minutes of snow shoveling satisfies your daily exercise requirement. There are even websites that will help you calculate the calories that you burn by shoveling. Shoveling snow can be a great, low-cost means to achieve a solid workout. But make sure that it is the right exercise for you. Because if you have heart disease, shoveling snow can kill you.